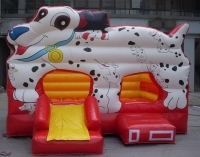 Bouncy castles in this category we find several models with measurements, prices, features and videos. Check if in stock or production forecast or make a purchase with the normal term. You can vote or comment on the products, each inflatable bears his full record. All our bouncy castles are their corresponding motor, carrying bag and repair kit protection and canvas. Shipments are on wooden pallets neatly packaged and identified. 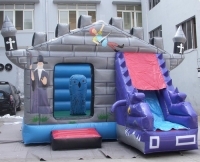 Our games are bouncy castles for indoor and outdoor, with a variety of colors we can choose the designs that we like. 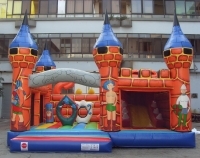 The bouncy castles are becoming more thematic as well as a few years ago the castle was the most common form, now you can find inflatable set in various subjects. Inflatable structures are equipped with safety nets, anchors to restrain and prevent the inflatable does not move. Our materials are in accordance with the regulations m2 fireproof canvas, painted on two sides of this form with just a damp cloth and a little soap making no effort to leave the dirt after use your bouncy castles, and were ready to be used as new again, CE-certified engines. The reasons for his success are spectacular in volume terms and variety of shapes and colors used. Ideal for children's events and parties, a major attraction for children infant. More and more local parks and children's entertainment that use the resource of bouncy castles and attraction. Bouncy castles inflatables. Highlights front as dalmatian dog-shaped, a little bouncy for rrellenar spaces and decorate .. Size: 4 x 4 x 2.5 Turbine Nº 1. This cute inflatable is perfect for events and children's parties. The bouncy castles for playgrounds. Measures: 4.5 long x 4 wide x 3.5 high turbine Nº. 1. This structure of the family is ideal for bouncy castles playgrounds. Dimensions: 5 long x 4 wide x 3 high turbine Nº1. 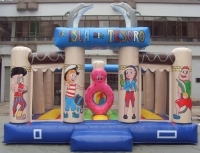 This bouncy castle is a large structure for children ages 3 to 8 years, set in the seabed and on an island where we emphasize its palm trees and colorful drawings. 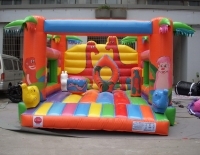 Bouncy castles: This inflatable is ready for mounting inside or outside, adorned with various pictures of the seabed. 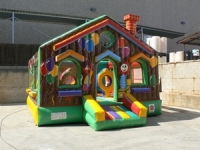 Bouncy castles inflatables: This structure is very used to have a slide and the roof closed. Size: 5m long x 4m wide x 3m high. Turbine Nº.1. 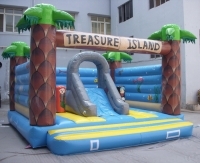 This bouncy castle is a large structure for children 3 to 10 years, set in an island where many pirates guarding their precious treasure. 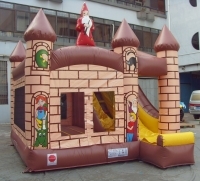 This bouncy castle for children 3 to 10 years, set in a castle hidden in the forest, we highlight their colorful drawings with wizards and knights. This bouncy castle for children 3 to 10 years, set in a castle like a farm for promoting work in the field, highlight your drawings with farm tools and animals. Inflatable castles with pictures of animals and completed with green palms simple inflatable makes a powerful appeal to their facilities ... Size: 5m long x 4.5 m wide x 3m high turbine No. 1. This cute inflatable is perfect for events and children's parties. The magician Merlin prominently on the top. Measures: 4.5 long x 4 wide x 3.5 high turbine No. 1. 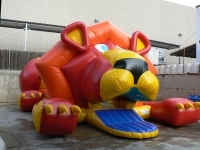 Bouncy castles, a model quite spectacular bouncy castle lion, with a very definite find the figure of a lion quite impressive. We wanted to make the entrance through the mouth using the tongue as access any game for children. Set in a bouncy castle from the Middle Ages, knights and dragons, princesses and wizards ... Size: 6m long x 5m wide x 4m high turbine Nº. 2. 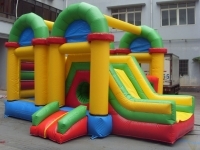 Bouncy castles: This structure combines many colors, we like to highlight their various ways, tunnels, ramps where kids can be accessed from several entrances.